Home / Fascinating Facts / Is Your Writing Like Angel Food Cake? Is Your Writing Like Angel Food Cake? Honestly, you can’t make these things up. Today is National Angel Food Cake Day. If you’ve been following my blog for a while, you know that I love to bake. Italians show love through their food, and the old saying, “The way to a man’s heart is through his stomach,” was probably said by someone’s nonna after winning her man with homemade cannoli. I’ve made countless desserts in my life. More cakes than you can fathom. I’ve even decorated dozens of them for birthday parties. But I’ve never made an angel food cake. Never. Don’t get me wrong, I love angel food cake. I’m especially fond of it soaked in raspberry Jell‑O and topped with whipped cream (maybe cut into cubes and mixed with fruit, too). But I’ve never baked one. I don’t have a pan, and every grocery store sells them ready made. Not quite as good as homemade angel food cake, but it’s hard to pass up the convenience. I don’t know if angels eat, but if they do, I could see why they’d like this cake. And why am I telling you all this? Because it’s interesting, in a not-so-fascinating kind of way. How did a cake get a whole day devoted to it? Why October 10? Who decided to make the first cake in an ungreased pan (madness!)? Why don’t people frost this cake? But two things struck me about this day. One, angel food cake is a lot like writing. And two, angel food cake day is actually a life-lesson we can all benefit from. Don’t believe me? Read on. Indulge me for a bit. 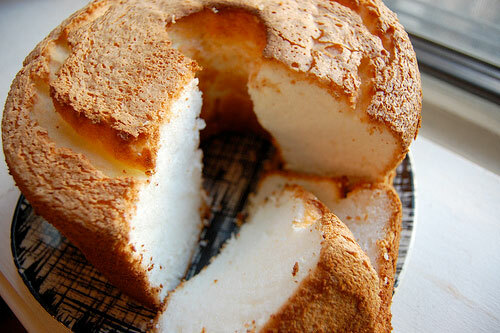 Angel food cake is difficult to make and is only successful if a specific formula is followed. Egg whites have to be whipped into meringue. Stabilizer has to be added for structure. The proper pan must be used for lift. The cake has to be cooled upside down so it doesn’t fall. And isn’t a novel the same? Plots have to be whipped into shape. The three-act structure gives it stability. Fully-developed characters carry the story. It will all fall apart if the ending isn’t crafted properly. Writers, take the time to make your novels a masterpiece instead of a hastily slapped-together work that might not rise to your readers’ expectations. The story of angel food cake and its achieving a national holiday is a lesson we can all learn from. Most of us won’t leave our history behind. We won’t be written about on Wikipedia and our biographies will be lost to the masses. But like the cake, even though our histories are lost, our legacies will live on. Through our family, our friends, our work. Are we going to stand out from the crowd, elite and exceptional? Or are we going to blend in to all the others, uninspiring and easily ignored? I want my legacy to be the stuff angels crave. And that will only happen if I rise to the occasion and be the best I can be. What about you? Are you an angel cake or a dry scone? Let’s discuss (but grab a cup of coffee and a piece of angel food cake first!). Italians show love through their food. Confirmed! The way is not the same in every part of Italy, some of us are more reserved other are more exuberant, but that’s true. I think it’t because food is an excuse to spend time together, it is in our blood. In my family we don’t dine untill everyone is home and it’s not forced, it’s normality. Anyway… I’m pretty sure my writer is more on the “dry scone” side :/ But that’s okay, I’m still working on finding my “right mixture” .. Because just like some recipes: Sometimes it takes several tries to get it right! Never had a slice, but love how everything is important in the mix to make a good cake or story. I’m curious… Do they not have angel food cake there, or is it a choice not to eat it? I recommend you try it at least once, but not if you have a dietary restriction prohibiting you. I am always impressed with how you can relate all of life’s happenings and foods to the writing life. Good job, Staci. I’m Italian, P.C. Of course I relate everything to food! 😉 Thanks for commenting. Great post! I’ll never look at Angel food cake in the same way. 🙂 (I’ve never baked one, either.) Good thoughts here. As writers, we should take the time to prepare and make our work the best it can be.